Continued independence and enriched living are our goals. 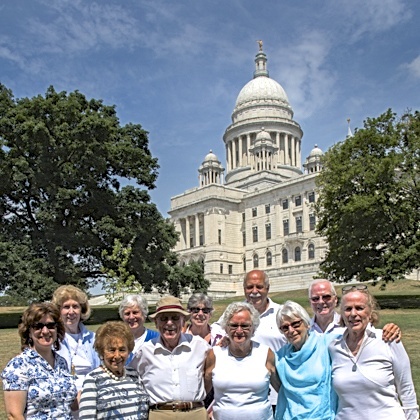 We are a friendly, active senior community located on the beautiful East Side of Providence, Rhode Island. With 154 apartments that range from affordable one-bedroom units to custom-designed penthouses, we have your new future home. Download our brochure here. Our purpose is to minimize worry while maximizing a vibrant, gracious and independent lifestyle. With our cooperative structure and apartments available for purchase, you’ll enjoy the benefits of owning your own home without the bother of having to maintain it. View a list of our included amenities here. The Laurelmead lifestyle offers a wide variety of cultural, educational, social and fitness opportunities designed especially for those who want the most out of life. Life here is rewarding – and it’s also fun! At the heart of Laurelmead is our exceptional community of residents. Different generations of adults with various backgrounds, experiences and interests call Laurelmead home, and we honor diversity and all viewpoints. Visit us on Facebook for a look at our programs and adventures. Laurelmead has enjoyed great success since opening its doors in 1994 and is always looking at creative ways to continue that success into the future. Therefore, we’re very happy to announce that Laurelmead has partnered with Mott & Chace Sotheby’s International Realty for the 2018-2019 selling season. To view our page on the Mott & Chace Sotheby’s website, click here. join our Next Generation Club to participate in the Laurelmead life and receive prompt notice of available apartments. Mayor Elorza visits Laurelmead for a Q & A session with our residents. We love Providence, Rhode Island! Click for our top ten reasons. And for youthful seniors and Baby Boomers, click for individual stories here.